Brightkite: is a location-based social networking website that is available on any mobile device. Users "check in" at places by using text messaging or one of the mobile applications and they can see who is nearby and who has been there before. The service was created in 2007 by Brady Becker, Martin May and Alan Seideman who previously founded the SMS notification service Loopnote. Pro's: Nice interface and it good social features. Group text is intriguing. Con's: Less 'game play' then I've come to expect. Feels like it needs a lot more to stay competitive. Friends Around: Friends Around is a mobile app for interacting with friends 24/7 across social networks without being tied to a computer. 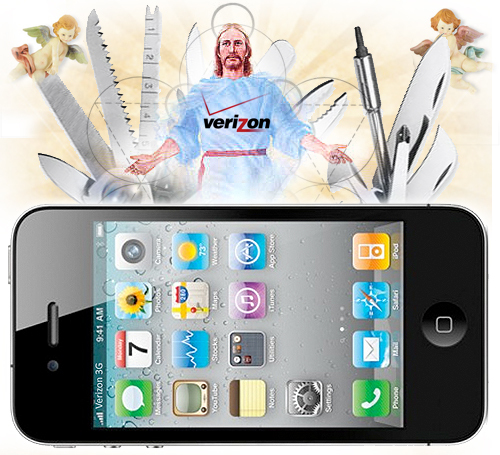 It’s a free iPhone app developed by Zila Networks LLC, a Miami based start-up. Pro's: A lot of rating based feedback from uploaded photos. Con's: Cumbersome to add new people and just not that much fun yet. I relies that the mapping function [should] be cool but it's too early for engagement. This app too needs to get more feature rich to compete I'm affraid. Side Note: I did see a lot of late teen - early twenties male demo on this at an NFL game I checked into this weekend. I'm not sure what, if anything that means. 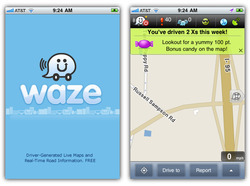 Waze: Waze is a social mobile application providing free turn-by-turn navigation based on the live conditions of the road. 100% powered by users, the more you drive, the better it gets. Pro's: This is a turn-by-turn GPS application yes, it's also a bit of social gaming. What I LIKE about Waze is it combines the intelligence of Trapster and adds a dash of game play. You unlock points and seniority by the amount of mileage you drive while using it, that's a bit of a pro and con to me. Con's: There's a lot going on. They could invest in some UI testinging as well. Also, rule number one with wayfinding, name it what everyone else names it. Don't call "Directions" "Drive To" call it directions and everyone (mainly me) will be happy. Whrrl: Whrrl 3.0 is a social location-based game to get people out into the world trying new things. Users become members of "Whrrl Societies" based on their real-world passions. As of August 2010, there were more than 3,000 Whrrl Societies. Whrrlers earn "influence points" as they try new things themselves and successfully inspire others to try things, and they share ("prove") their adventures by sharing photos and text with friends and other Society members. Pro's: First, the app looks and responds beautifully. Elegant animations and transition screens abound. It's powered by BING.com which proves to offer a lot of initial data respectively. The app's a bit advanced to a user unaccustomed to a check-in environments. As you're checking in, it's making you a founder to established locations and creator of societies of influence. Very cool, but a bit heady given that you're new to proximity based (location based) applications. Con's: A lot to take on if it's your first but I don't have any outstanding fails – yet. Posted on September 13, 2010 by Justice Mitchell and filed under Applications, Interactive, Mobile, Trends and tagged Applications Check-in Checkin Iphone apps location based proximity based reviews smart phone.